Matter and Interactions, 4th Edition offers a modern curriculum for introductory physics (calculus-based). It presents physics the way practicing physicists view their discipline while integrating 20th Century physics and computational physics. The text emphasizes the small number of fundamental principles that underlie the behavior of matter, and models that can explain and predict a wide variety of physical phenomena. 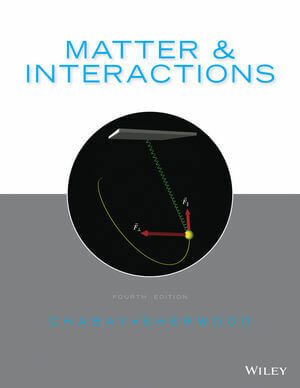 Matter and Interactions, 4th Edition will be available as a single volume hardcover text and also two paperback volumes. Ruth W. Chabay is the author of Matter and Interactions, 4th Edition, published by Wiley. Bruce A. Sherwood is the author of Matter and Interactions, 4th Edition, published by Wiley. Online Homework – now all of the end-of-chapter problems are available for assignment with the WebAssign online homework system. Instructor Solutions Manual – The new edition is accompanied by a complete instructor solutions manual. NEW Student Solutions Manual – contains full solutions to a selection of end-of-chapter problems. Increased support for computational modeling throughout. Discussion throughout the text contrasting iterative and analytical problem solutions. Many new computational modeling problems – large and small. Improved discussion throughout of the contrast between models of a system as a point particle and as an extended system. Improved discussion of the Momentum Principle throughout Volume 1. Improved treatment of polarization surface charge in electrostatics (Ch.14) and circuits (Ch.18) based on computational models. More extensive problem sets at the end of each chapter, with improved indication of difficulty level. Modeling: The text places a major emphasis on constructing and using physical models. A central aspect of science is the modeling of complex real-world phenomena. A physical model is based on fundamental principles; its intent is to predict or explain the most important aspects of an actual situation. Computer Modeling: Computer modeling is now as important as theory and experiments in contemporary science and engineering. Computer modeling is introduced early to help build a strong foundation in the use of this important tool. Experiments Using Simple Equipment: Some end-of-chapter problems involve experiments using simple equipment such as weights, string, coffee filters, scotch tape, etc. By experimenting with very simple equipment, students can gain insight into rather deep scientific issues. Active Learning: Stop and Think questions are interspersed throughout the reading to encourage students to engage the material more deeply. Lab Activities: There is a complete set of lab activities that were written specifically for a Matter & Interactions-style course.